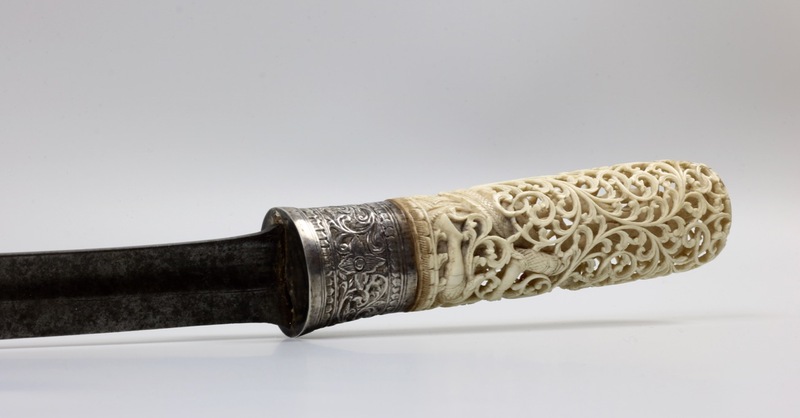 An ivory hilted Burmese dah or commonly, dha . It is fitted with a high quality but later associated blade, probably from the Shan region. The blade of typical profile, narrow at the base and widening near the tip. It has a precisely ground wide fuller on each side that is accentuated by a thin engraved line. The spine of the blade is ridged, with a stepped section near the tip, a rather rare feature on these. Such elaborate work is typical for the late 19th and early 20th century. A fascinating little monograph is written on the subject, published in 1901, by Pratt. According to Pratt, the only towns in 1901 that still worked ivory were Mawlamyine and Pyinmana in present-day Myanmar. Only one carver was active in Pyinmana, and by far the best work was done in the coastal city of Mawlamyine where in 1901 three families were still active in the trade.2 Interesting, the same survey states that these artifacts were always made on order, never in anticipation of demand. 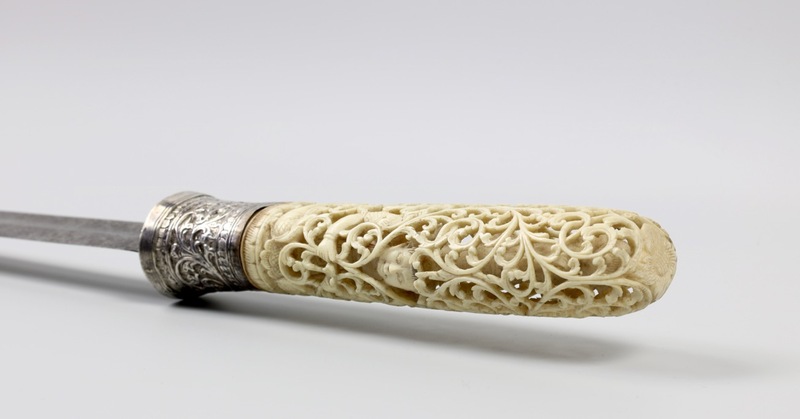 Pratt continues to describe how some of the ivory was bought from Shan traders or from working elephants that had died a natural death or broke a tusk.3 The total ivory carving business in Mwlamyine in 1901 made use of only 8-12 pairs of tusks. Interestingly, he mentions the smaller tools used around this time are pieces of umbrella ribs that they sharpen on a stone to turn then into little chisels. Blade and handle are in excellent condition. The blade only with tiny spots of natural patine, no nicks of cracks, blade is straight. The previous owner told me he had joined the blade and handle about a decade ago. It is expertly done, they match very well, but were not "born together". There is a tiny, very skillful repair in one of the vines near the back of the handle. 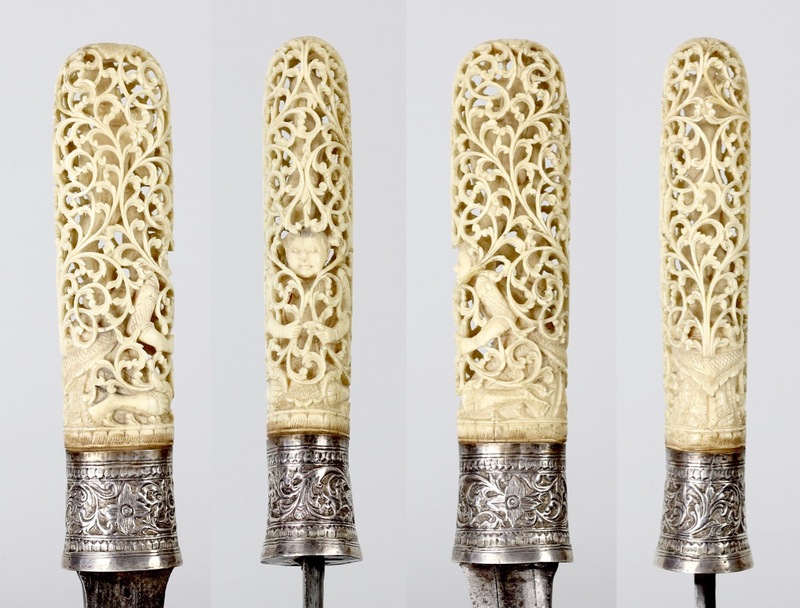 A Burmese sword with an impressive openwork handle. 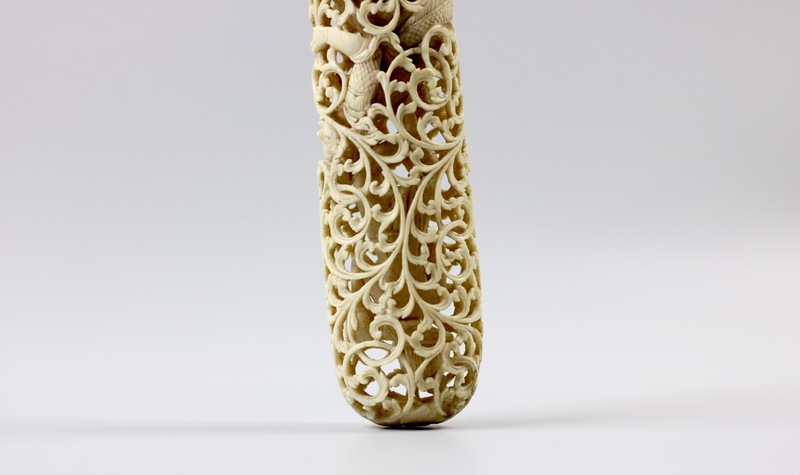 This feat of ivory carving represents some of the best work coming out of Burma. It is mounted on an associated blade which is interesting in its own right, exhibiting excellent quality workmanship and some rare features for the type. All in very good condition. 1. Thanet Natisri, personal communication. 2. H.S. Pratt, I.C.S. 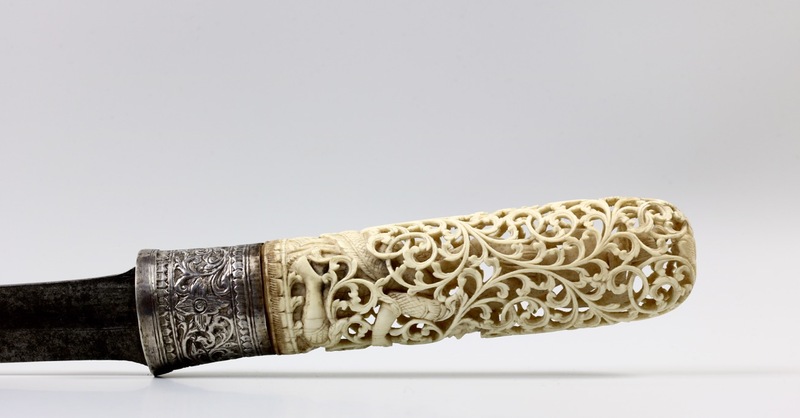 : Monograph on Ivory Carving in Burma. Rangoon. Printed by the superintendent, government printing, Burma, 1901. 3. Elephants in Burma were quite commonly as mounts, working animals, beasts of burden, or even as war elephants. This meant there was a ready supply of ivory obtained from natural death / loss. 4. 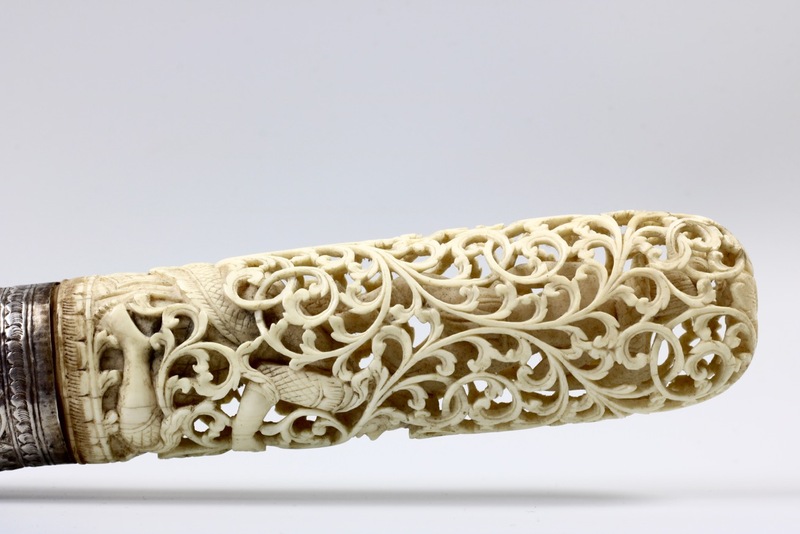 Pratt: Monograph on Ivory Carving in Burma. 1901.